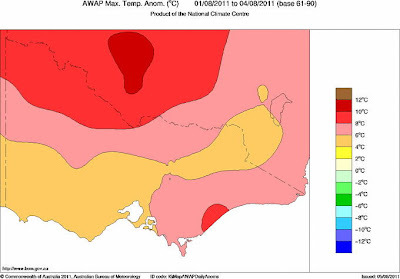 A high pressure system centred over the NSW coast drifted into the Tasman Sea on the last weekend of July 2011. The high pressure system directed north westerly winds across Victoria. This northerly wind flow contributed to Victoria experiencing unprecedented warm weather for this time of year. Many early season heat records were set for both warmest day and warmest night following mid winter (noting that late June/early July is typically the coldest time of year in southeast Australia). . .
23.1°C set on July 30th 1975. Perhaps the most remarkable observations during the warm spell occurred during the early hours of August 4th when many sites in coastal Victoria experienced exceptionally mild conditions. As an example, Wilson Promontory recorded a temperature of 23.5 °C at 4am, approximately 15 °C above average and easily breaking the old high temperature record of 22 °C set on 28 July 1975. August 11 Update: There were 42 all-time record high temperature records set in the first week of August. That is over 5 times the number of all-time low temperature records set in all 3 months of last winter. This summer's sound of crashing temperature records has resoundingly echoed through the first week of August. For August 1-9, the number of new daily high temperature records set in the U.S. has overwhelmed the number of low temperature records by an astounding ratio of 23.9 to 1. 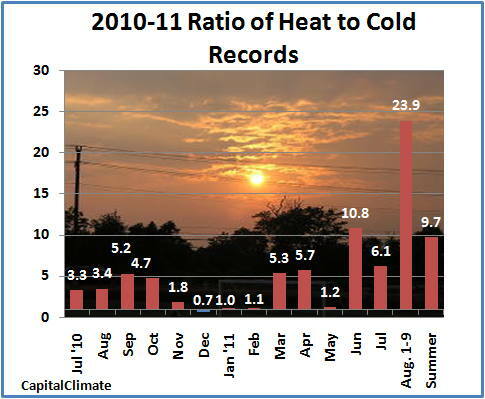 The excess of heat records over cold records has been more than 1000. This has raised the ratio for the summer to date to almost 10 to 1 with just over 3 weeks remaining in the season. Although the most extreme heat has been focused on Texas, Oklahoma, and Arkansas, nearly all of the country has been averaging above average temperatures except for the Pacific Coast, Nevada, and Utah. - Monthly ratios of daily high temperature to low temperature records set in the U.S. for July 2010 through Aug. 9, 2011. Data from NOAA National Climatic Data Center, background image © Kevin Ambrose (www.weatherbook.com). Includes historical daily observations archived in NCDC's Cooperative Summary of the Day data set and preliminary reports from Cooperative Observers and First Order National Weather Service stations. All stations have a Period of Record of at least 30 years. - Preliminary U.S. average temperature and departure from normal for Aug. 1-8, 2011 from Climate Prediction Center/NWS/NOAA. The National Climatic Data Center's preliminary July report issued today shows that the Oklahoma July average temperature of 88.9 degrees F (31.6 degrees C) was the highest for any state in history. The Texas July average of 87.1 degrees F (30.6 degrees C) was also the hottest ever for that state. The previous hottest month was July 1954 in Oklahoma at 88.1 degrees F (31.2 degrees C). Delaware also had its hottest July in history. Top-ten hottest Julys were observed over a wide area from New Mexico and Colorado eastward through the Mississippi Valley, Great Lakes, Southeast, Mid Atlantic, and southern New England. The only states with below-average temperatures were Washington, Oregon, California, Idaho, and Nevada. It was the 11th coldest July in Washington state. The average U.S. temperature in July was 77.0 degrees F (25.0 degrees C), which is 2.7 degrees F (1.5 degrees C) above the long-term (1901-2000) average, resulting [in] the fourth warmest July and the fourth warmest month on record.